5 June 2018 — Brisbane’s Aerials are soaring high today, announcing the imminent release of their new single and video “Drawing Blood.” Bursting with neck-breaking riffs and “Blade Runner” inspired synthesizers, “Drawing Blood” is the latest and certainly their hardest-hitting single. They are also today rolling out the news of the celebratory tour dates in July 2018, hitting up hometown Brisbane and visiting Sydney and Melbourne in a short-but-sweet bunch of live events that sees them playing in Brisbane’s The Foundry, Sydney’s iconic rock box Frankie’s Pizza and Melbourne’s rock palace Cherry Bar. The new single will be live for purchase and streaming (iTunes, Apple Music, Spotify and more) from this Friday June 8th, and pre-sale tickets for the Brisbane show will be available same day. Stepping away from self-production, AERIALS teamed up with producer-duo Clint Vincent and Luke Palmer from rock heavyweights Dead Letter Circus to record their heaviest single to date. Formed in Brisbane 2011, AERIALS hit the touring circuit hard with their independent EP’s “Firefights (2013)” and “Restless (2015)”, which earned them rotation through RAGE, Channel V, community radio as well as nods from triple J’s Dom Alessio and QMusic, playing at Bigsound. Taking no prisoners with audiences, their blistering live show resulted in a boastful list of support slots with top-tier national and international acts such as Birds of Tokyo, FUEL (US), Lifehouse (US), MEW (DK), Ash (IE), sleepmakeswaves and The Getaway Plan. After months of hashing out demos in pre-production, the band settled on “Drawing Blood” as the first release of the new batch on the basis that it represented a new heavier direction for the band. The track morphed its way through five different versions, as the band explored new sonic territory and attempted to harness the energy of the song’s lyrical theme – overwhelming regret. 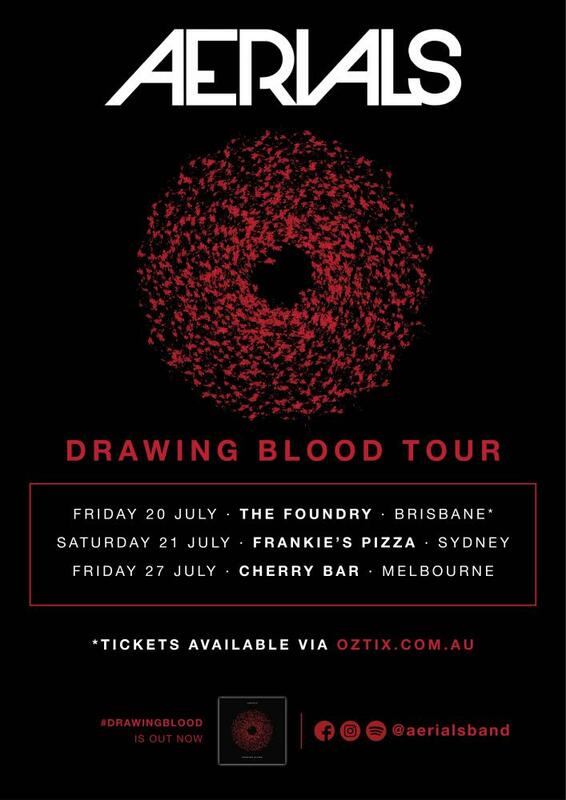 “Drawing Blood” is released on June 8th 2018 through all digital platforms, followed by an East Coast Australian tour in July 2018. For more information, go to http://aerialsband.com.